Using check-procs from the official check plugins pack, you can monitor processes. For information on installing the official check plugin pack, you can refer to Using the official check plugin pack for check monitoring. 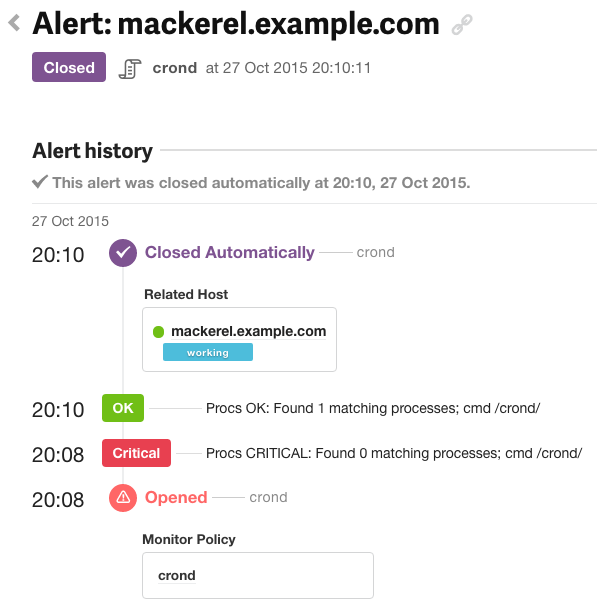 To monitor cron, we will first append the following item in mackerel-agent.conf and then restart the mackerel-agent. In the --pattern option we will assign a regular expression that will match to the target process. With this arrangement, if crond suspends operations an alert will be opened, and when the process is restored the alert will close automatically. check-procs has the following available options, and it’s possible to configure thresholds for the number of processes. This is convenient when you want to monitor the number of worker processes. The following configurations would be made, for example, when you want to monitor with the number of Nginx workers included. In this example, if the number of Nginx workers is less than 8 or more than 10, a Warning alert will be raised. If the number is less than 1 or greater than 30, a Critical alert will be generated. We have designated the executive user with the --user option and made configurations to more accurately collect the number of workers. There are additional options for check-procs such as for monitoring the execution time and the status of processes. For more information please refer to check-procs --help and the README. The source code for check-procs is publicly available via the URL below.